Nursery Decor: Rainbows & More! I thought it would be fun to showcase nursery decor around a particular theme—today’s feature is all about rainbows! I noticed my Pinterest board filling up with everything RoyGBiv. Truth be told, this post feels more applicable to a spring refresh, but kids of all ages (adults too!) adore these colors and who doesn’t love a rainbow? Especially on cool, dreary days. Keep in mind, rainbows are not all or nothing. They’re a great way to add a splash of color in pillow, blanket, or wall art form, and they come in many color variations from brights to pastels, even neon. 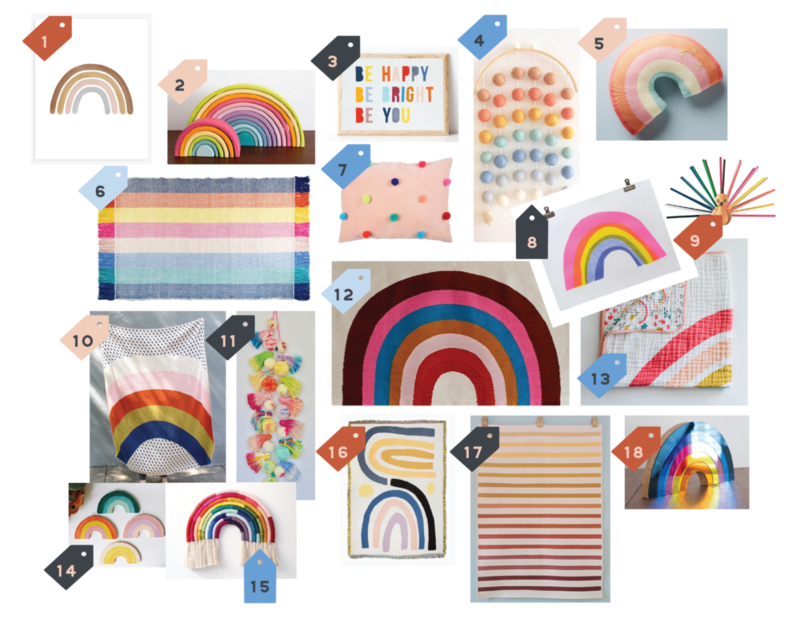 Without further ado, here are 18 super cute rainbow accessories to add some color to your little one’s space. If there’s one piece of furniture every nursery needs, it’s likely a crib. Although I might debate the glider/recliner is equally as necessary, but I’ll save that for another post. Space considerations: Is a standard-size crib the right option, or do you need a smaller scale option? There are several great crib options designed specifically for small spaces. Style considerations: Are you planning to use the same crib for future children? If so, it’s practical to choose a gender neutral option and a style that can adapt with any future changes to the room’s look and feel. Material considerations: Do you have preferences about materials? I’m always a fan of solid-wood construction for longevity purposes and there are also many manufacturers that now offer GREENGUARD certified cribs (which means the product has met some of the world’s most rigorous standards for low VOC emissions into indoor air) at a variety of price points. Convertibility considerations: Do you want a crib that can transition with your child as their sleeping needs change? Many cribs convert to toddler beds and some even convert to queen beds. If you think you’ll use your crib as a toddler bed, it’s a good idea to purchase the toddler rail (often sold separately) to ensure it’s available when you need it. Below are my favorite standard-size crib options for a modern, timeless look that can be dressed up or down, for boys and girls, depending on your stylE. A classic style crib with a light, two-tone look—I purchased the Scoot crib for Leo’s nursery and have been extremely happy with it. It converts to a toddler bed (with included rail) or to a daybed when your little one is ready to move on. Made of New Zealand pine and GREENGUARD Gold Certified-screened for 360 VOCs and over 10,000 chemicals. Another crowd favorite, the Lolly crib is the perfect addition to a modern nursery. Made of New Zealand pine and GREENGUARD Gold Certified-screened for 360 VOCs and over 10,000 chemicals. The IKEA crib is a fantastic wallet-friendly option made of solid beech wood. It’s loved by moms and designers alike. One side rail can be removed to create a toddler daybed and at only $79, you can’t beat it. Olive green is having a moment right now and this crib, with it’s sleek lines, can be dressed up with garden florals for a sweet baby girl’s nursery or paired with gingham for a little boy’s woodland retreat. Made of solid poplar, solid rubberwood, and low-emission engineered wood with a non-toxic finish. The latest collaboration between West Elm and Pottery Barn Kids is so, so good. This mid-century beauty comes in two great colors—white and acorn, which is a great medium-tone wood option. It’s GREENGUARD Gold Certified and Fair Trade Certified, made of solid sap gum wood and MDF (medium density fiberboard). I’ve loved this crib for a long time and it’s still a top contender. The cross-pattern legs are a lovely design detail that doesn’t get overlooked. It’s made of solid poplar wood, converts to a toddler daybed, and comes in both white and grey. You’ve likely seen this beauty make her rounds on Pinterest and Instagram, and for all the right reasons. The Caravan crib is designed in LA and made in Pennsylvania of solid American maple. It’s the ultimate convertible crib as it can be used as a toddler daybed or flexible seating anywhere in the house. You can make it yours by selecting from a collection of limited edition rail colors. A great dark wood option, the Rhea crib is GREENGUARD Gold Certified and made of solid birch and baltic birch plywood with non-toxic finishes free of VOCs. I love Oeuf for their commitment to quality and design, both in their covetable furniture as well as their kids clothing and accessories.